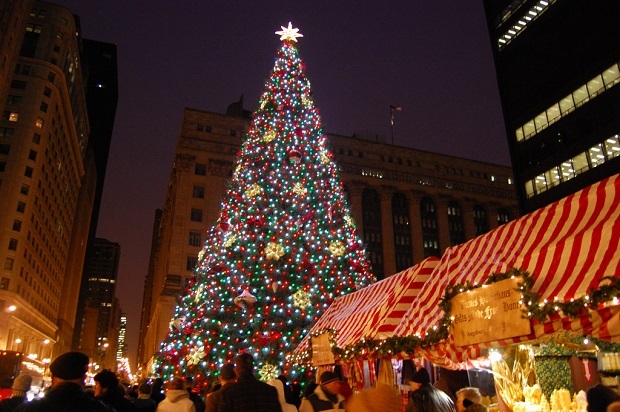 It is Christmas time in Chicago this 2018 holiday season and that means you need to gather friends and family and check out the main FREE 2018 Chicago Christkindl Market in Daley Plaza this Christmas season from Nov 16 to Dec 24, 2018. The red-and-white-striped huts of the free 2018 Christkindlmarket in Daley Plaza invite holiday shoppers to take a virtual trip to storybook Germany. Chicago’s 23rd annual Christkindlmarket is a chance to savor Old World traditions in Chicago while temporarily forgoing suburban malls, familiar chains and big-city department stores. It is free to peruse and the vendors at the market, gearing up for its 23rd year, will offer unique treasures at one of the largest German-style Christmas markets outside of Germany. 11 a.m. to 9 p.m. Fri. and Sat. Santa Claus will once again set up shop on Daley Plaza in an all new Santa House provided by Ecodome Inc. Santa’s Midwest headquarters will be open to children of all ages, where they can experience the wonder of the North Pole and have their picture taken with Santa Claus throughout the holiday season. CHECK OUT THE EVENTS SCHEDULE HERE. More than 65 percent of them travel from Europe to set up shop Nov. 16-Dec. 24 in Chicago’s Loop. Imported goods at the little shopping village include nutcrackers, cuckoo clocks, wood carvings, beer steins, wooden toys and jewelry, plus ornaments of all shapes and sizes. But many merrymakers come for the German food and drink, indulging in bratwurst and potato pancakes, schnitzel and strudel. They quench their thirst with a glass of German beer or Gluhwein (hot spiced wine) served in a souvenir boot-shaped mug.Several walk-in cabins offer a warm place to shop, and the Lufthansa Festival Tent and the Timber House provide a place to relax and enjoy the goodies. Music and dance performances are scheduled at various times. 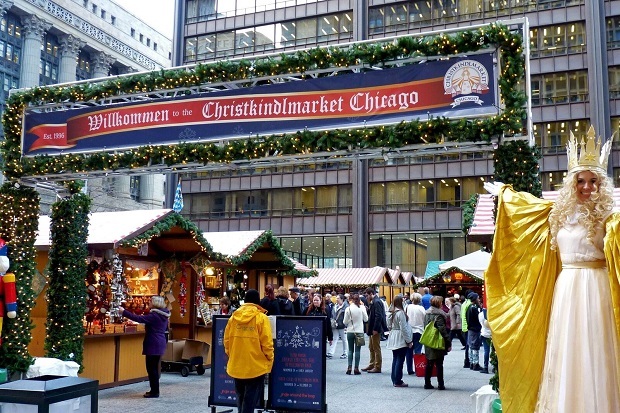 In celebration of its 23rd anniversary, the Christkindlmarket Chicago returns to downtown Chicago on November 16th, 2018 and invites all visitors to enjoy one of the most enchanting atmospheres in Chicago during the holiday season. Recognized as one of the top holiday markets in the U.S. by Travel + Leisure magazine, Christkindlmarket Chicago transforms Daley Plaza into a magical picturesque European Christmas village filled with candy cane striped wooden huts and twinkling lights that harkens back to the traditional holiday market in Nuremberg, Germany. Since 1996 German American Services, Inc., a subsidiary of the German American Chamber of Commerce of the Midwest, has hosted one of the largest traditional Christmas markets outside of Europe. 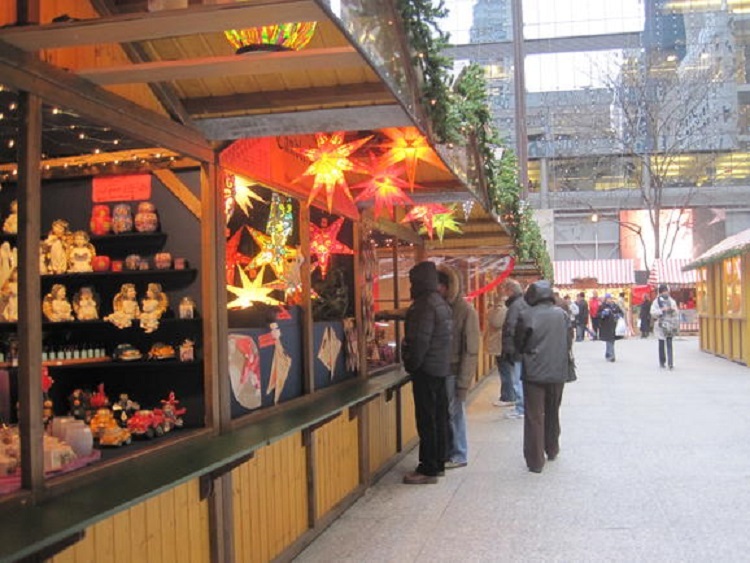 More than 65% of the vendors travel from Germany to Chicago each year to share their fine wares and holiday traditions. 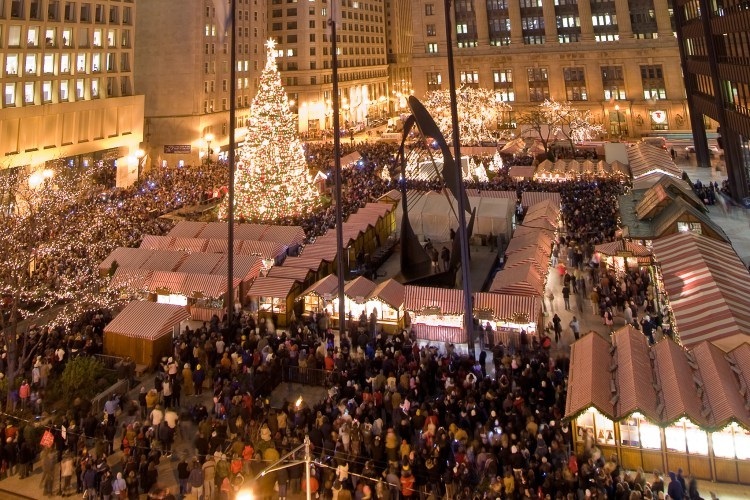 With free admission, the Christkindlmarket Chicago attracts over an estimated million visitors each year from around the Chicagoland area, nation, and the world. The Christkindlmarket Chicago is host to nearly 60 vendors boasting one-of-a-kind offerings that are destined to become treasured gifts for loved ones of all ages. 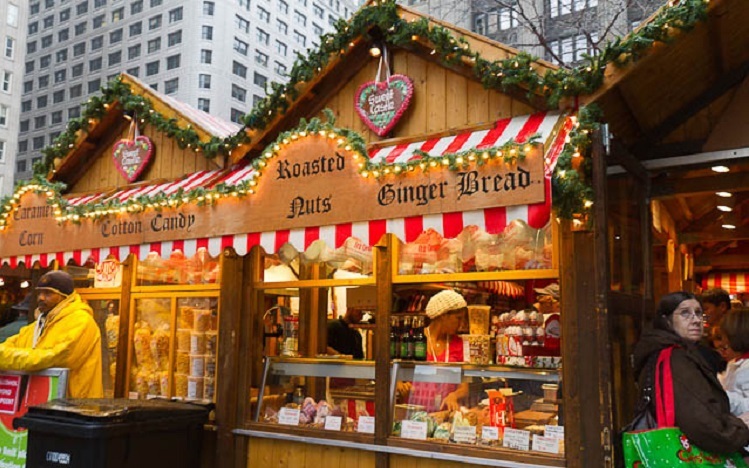 The traditional wooden huts are filled with a wonderland of fine gifts including hand-made holiday ornaments, nutcrackers, cuckoo-clocks, beer steins, wooden toys, jewelry, wood carvings, and European sweets and treats. The market also has various heated walk-in cabins that offer a cozy place to take time and shop for unique gifts. The Grand Timber House and Festival Tent provide visitors a place to warm up, sit down, and enjoy delicious food and drinks such as specialty sausages, potato pancakes, schnitzel, Stollen, and pretzels. Guests can also quench their thirst with a refreshing imported German beer or warm up with a cup of Glühwein (hot spiced wine), which is served in the popular collectable souvenir mug. Throughout the 35-day event, the Christkindlmarket hosts live entertainment and performances including school groups, professional singers, dance groups and much more. On weekends, the roaming Alpine Brass band with its festive German holiday music is sure to stir and awaken the spirit of the season in all. Special events include appearances by the Christkind (the namesake and symbol of the market) the annual Children’s Lantern Parade, Theatre day and much more! One of the most popular events is the daily Advent Calendar. Starting December 1st, one lucky visitor each day gets to help us count-down until Christmas Eve and win a gift from one of the market’s special vendors. The popular “Kinder Club” boasts fun activities geared towards the youngest visitors. Children and the young-at-heart can go on a scavenger hunt to explore the market, interact with the vendors, and learn more about German holiday traditions. Collect an ornamental paper crown and the Christkindlmarket Passport activity book, which includes coloring pages, riddles and much more.